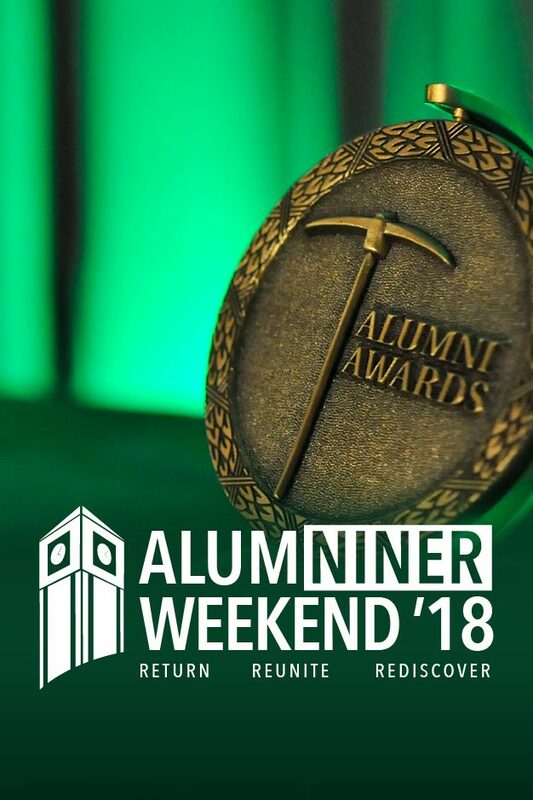 The UNC Charlotte Alumni Association is excited to present the annual AlumNiner Weekend on April 20-21. Open to all friends and alumni of UNC Charlotte, the weekend offers a notable lineup of events for everyone. Whether it has been five or 50 years since you last set foot on campus, you won’t want to miss out. And don’t forget: You can use light rail to connect to campus for all the fun. For more details and a full listing of events, visit the UNC Charlotte Alumni Association website. 11:00 AM – 1:00 p.m.
Join us as we recognize alumni, faculty and friends who have made important contributions to the establishment and growth of UNC Charlotte. Our 2018 award recipients truly embody the core principles of UNC Charlotte and have distinguished themselves through their outstanding service to our campus, their chosen fields and to society. Two recipients are from the College of Liberal Arts & Sciences. Lauren Lowery, who received her BA in English and Philosophy in 2009, and Meghan Stamper, who received her BA in Communications Studies in 2008, are the 2018 recipients of the Outstanding Young Alumni Award. We are bringing the charm and elegance of the Kentucky Derby, Preakness and Belmont Stakes to Uptown Charlotte. Run for the roses and don your best Derby hat to help raise funds and awareness for need-based student scholarships. Purchase your tickets today. Enjoy a delicious meal with fellow alumni and Chancellor Philip L. Dubois, while learning more about UNC Charlotte today: our growth, our students and faculty, our academic successes and the University’s impact in the Charlotte region and beyond. Having graduated 50+ years ago, the Half-Century Society stands as a living legacy to the history of the University.The Alumni Association invites all members of the class of 1968 and earlier to join us as new members are honored during an Induction Ceremony at the conclusion of lunch with the Chancellor. UNC Charlotte is growing exponentially. This is your opportunity to see how things have changed since your days on campus, whether that was five years ago or 50. We can’t wait to help you get re-acclimated to campus. The tour also will include a stop at UNC Charlotte’s new light rail station that “connects us” to the rest of the great City of Charlotte. Join us in Alumni Tailgate Village for food, friends and family fun before the exciting annual Green and White spring football game that will pit our offense against our defense with a modified scoring system.